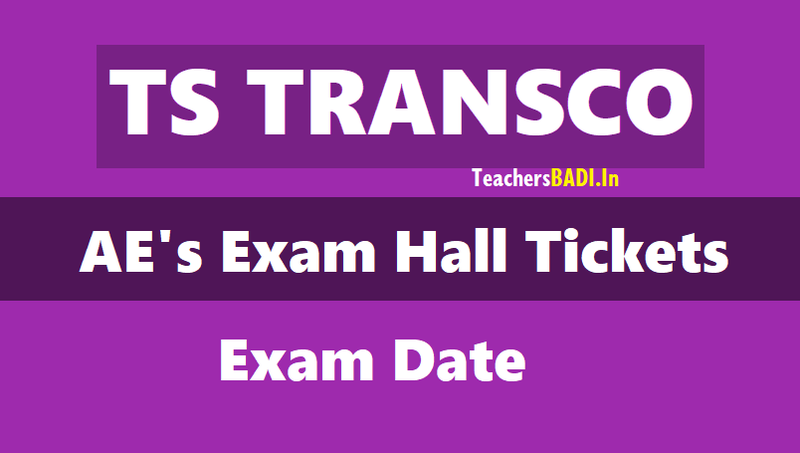 TS TRANSCO AE's Exam Hall Tickets, Exam Date: March 11, 2018: TS TRANSCO AE Hall Ticket 2018 will be released tomorrow i.e. 6th March 2018 on the official website of Telangana State Transmission Corporation of Telangana Limited - TSTRANSCO - tstransco.cgg.gov.in. As per the official website, ‘Downloading of Hall Tickets for AE's will commence from 06.03.2018 onwards’. TSTRANCO is scheduled to organize the Written Test on 11th March 2018 to fill 330 vacancies via Direct Recruitment of Assistant Engineers in Electrical, Civil and Telecom. Candidates who have registered for the same must keep a tab on the official website and download their Hall Ticket once it is released by the corporation. TSTRANSCO AE Recruitment Exam on March 11, 2018. The time and venue for an individual will be written on his/her Hall Ticket. Candidates must carry their Hall Ticket on the exam day and reach their examination centre 30 minutes before the scheduled time. Candidates will neither be allowed to enter the examination hall once the exam time starts, nor be allowed to leave the examination hall before the exam time ends. 1. Section A, which will comprise of 80 questions to test the core technical subject of respective discipline. 2. Section B, which will comprise of 20 questions to test the general awareness and numerical ability of the candidates.